I’ve been in hiding for the last two weeks or so, as I’m in a fairly intensive coding phase of my research project. While I normally take frequent breaks and interact with my coworkers, during focused coding efforts, I tend to lose track of time and tune out what’s going on in the office/outside world (hence the recent lack of posting…). Cherish has talked before about the effect of office space on productivity. Most of the time, I’m fairly happy with my office space. We’re lucky enough to have windows, and my office mates are all in my lab group. However, what I really want when coding is a cave with no distractions and a really large monitor. I also need enough space to scribble psuedo-code, to make sure it will do what I want before I start fretting about syntax. My prior desk served this role pretty well, as I was in a back corner next to someone who was rarely in the office. Unless there was a discussion by the microwave, it was a very quiet little nook. I could very easily pretend there was no one else, and was rarely interrupted. On the other hand, there are times when I enjoy being able to toss around ideas with others, and ask stupid syntax questions. It’s also good to have someone else look at your code and be able to spot issues like missing semi-colons. I recently moved out of the corner, and it’s been great for encouraging collaborations with others in my group, and avoiding some duplication of effort. What are some of your work habits? 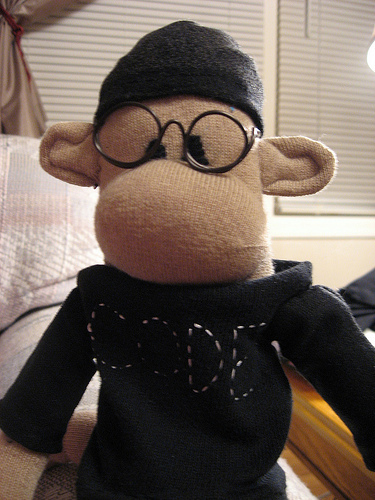 Code monkey image used under CC-BY-NC-SA 2.0 from Dave K.
Big noise muffling studio monitor headphones and music I can listen to for hours without distraction (classical and instrumental rock guitar, typically) help me focus in a cubical environment with a loud ventilation system and occasional distractions from co-workers. If i know ahead of time that I have some really soldering to do like populating boards or an intense rework I’ll make a point to come into work early that day and get it done in the morning. Nothing kills my productivity more than having to wait for some else to finish what they’re doing so I can jump on a microscope or use the hot air rework station. Should I just be doing typical lab work then I don’t mind having people around to bounce ideas off of, ask questions, or help me debug a circuit. Roughly half the time I’m listening to music or a podcast with my headphones in though. If I’m in my office doing layout or computer work then I definitely want to be left alone to crank out the task an hand. Headphones with faster paced music have always been my favorite thing to get my mind focused. A plant seemed to always help as well. I have been lucky and always have had a window seat, so I can stare at the clouds when stuck on whatever engineering problem is at hand.